Two West Village chefs join forces to form one solid Italian restaurant. 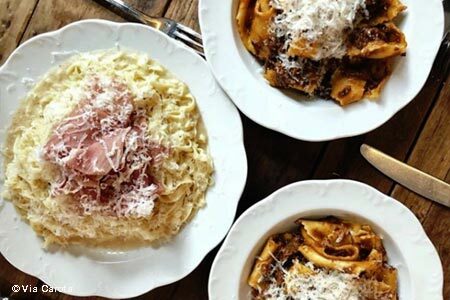 : Chefs Jody Williams and Rita Sodi’s Via Carota is located just up the block from Williams' Buvette and around the corner from Sodi's eponymous establishment. Which means one or both of the chefs might always be in the kitchen at this lively spot, named after a street Sodi lived on in her native Italy. The menu is heavy on fresh seasonal vegetable dishes --- a Jerusalem fried artichoke, acorn squash on a fried patty of scamorza, zest-covered fennel --- but the real flavors of Via Carota emerge in the small handful of pastas: buttery pumpkin ravioli; fluffy potato gnocchi that pair well with funky Gorgonzola. The wine list skips around Italy and includes bottles from off-the-radar regions like Molise. The by-the-glass options are plentiful and affordable.